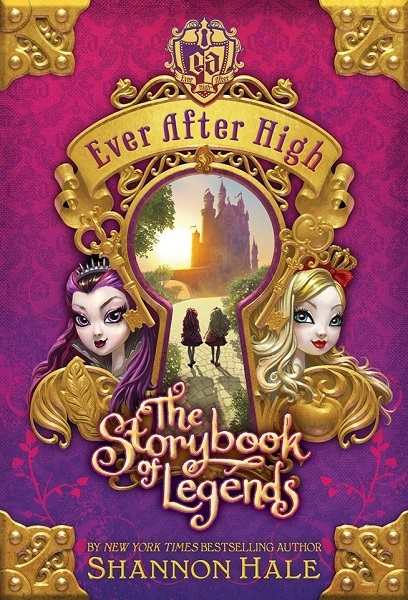 Summary: "At Ever After High, an enchanting boarding school, the children of fairytale legends prepare themselves to fulfill their destinies as the next generation of Snow Whites, Prince Charmings and Evil Queens...whether they want to or not. Each year on Legacy Day, students sign the Storybook of Legends to seal their scripted fates. For generations, the Village of Book End has whispered that refusing to sign means The End-both for a story and for a life. As the daughter of the Evil Queen, Raven Queen's destiny is to follow in her mother's wicked footsteps, but evil is so not Raven's style. She's starting to wonder, what if she rewrote her own story? The royal Apple White, daughter of the Fairest of Them All, has a happy ever after planned for herself, but it depends upon Raven feeding her a poison apple in their future. What if Raven doesn't sign the Storybook of Legends? It could mean a happily never after for them both." Review: So I just finished gushing over how much I loved Hale's Midnight in Austenland. You'd think I'd love the next Hale book I read, too. I didn't. But I didn't not like it either. To be fair, there were definitely plenty of things to like. The dialogue and the adventure were fluffy and adorable. This book is possessed with Hale's signature humor and wit. Raven and Apple are interesting characters, and their friendship is even more intriguing, considering their destiny to become mortal enemies. Maddie Hatter, Raven's best friend and daughter of Wonderland's Mad Hatter, is wacky and hilarious and endearing. She was hands down my favorite character. The rest of the Ever After High crew are an entertaining and remarkable bunch in their own right, though. I enjoyed seeing how the characters did and did not fit into their respective fairy tale destinies. The language here is positively dripping with puns. (For example: "hext messages," "wonderlandiful," "hexcellent," "charm you later," etc. The popular music artists "One Reflection" and "Tailor Quick" were mentioned more than once. You get the idea.) Depending on your taste, that could be funny or weird. It was both for me, at different times. I think the younger crowd will enjoy the puns more than I did. To be honest, I think the younger crowd will enjoy the whole book more than I did. I wished for a better feel and understanding of the school, and of the culture of the village of Book End in general. The plot was fun and had a few nice twists, but the stakes of Raven's choice to sign or not sign the Storybook of Legends could have been much greater if more attention was given to why the people believed what they did. It wouldn't have needed much, just a few more scenes of classes to understand the student/teacher dynamics and school culture, in addition to a few more conversations with older characters to understand what exactly happens after one signs the Storybook of Legends. That point was always a bit fuzzy, and I wished for more clarity. Teens who like the premise of this book, but who want something a little more substantive, would do better to pick up The School for Good and Evil by Soman Chainani. I should also add that this book is not a traditionally crafted novel. Little Brown and Mattel came together and decided they wanted to profit from the success of the Monster High books, and so the Ever After High series was born. 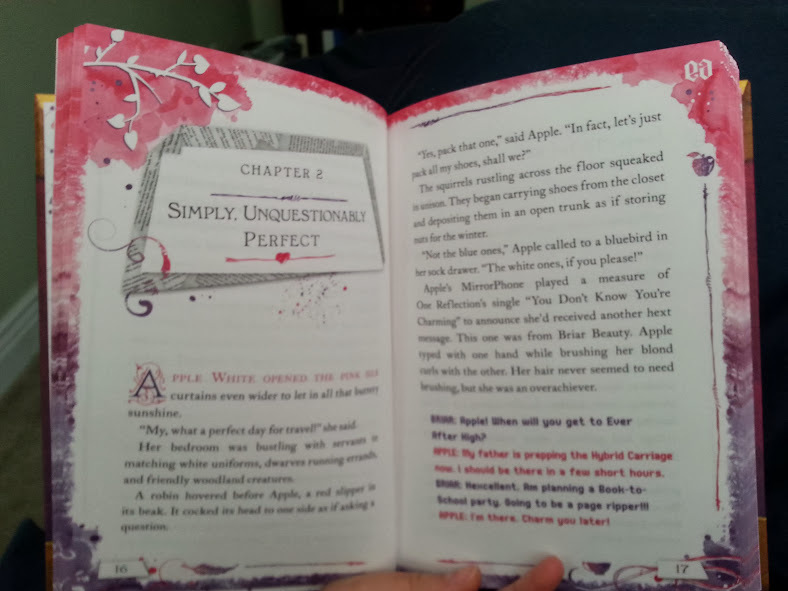 Mattel came up with a 200 page outline of the Ever After High world, complete with character profiles and details about the world those characters lived in. This was given to Shannon Hale, and she wrote the story using this outline as a guide. The many mentions of clothes and hairstyles do make the adult reader sometimes feel like this book is just being used to sell dolls (and make no mistake, Mattel is doing everything they can to profit from this series in the form of clothing, accessories, stationary, electronics and other consumer products) but Hale's lightheartedness manages to prevent the book from feeling like a giant advertisement. She has fun with her story, and invites us to have fun alongside her. And if we want to buy a few sparkly pencils along the way, so be it. That's not to say that it's not enjoyable. It is. I flew through the book quickly and happily, and I think many others will too. I just don't think this one is going to be a re-read for Hale's many adult fans. But I could definitely see the younger crowd getting into this book. This sounds right up my daughters' alleys... I'll have to check it out (literally, since the library is our best friend! ).